Caption slip reads: "Photographer: Paegel. Date: 1954-09-01. Date: September 1. Reporter: Bernstein. Assignment: Birger Tinglof Knighted. 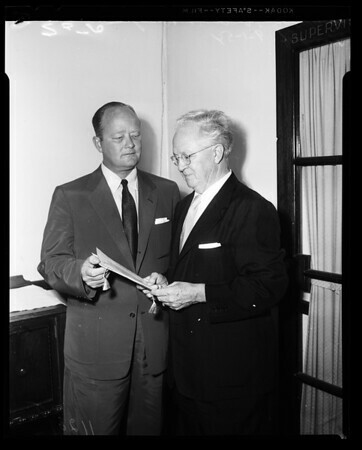 25/26: From left, Albin Tollin, president of the Swedish Club of Los Angeles presents notification of knighting to Birger Tinglof, attorney and president of the Lutheran Hospital Society of Calif.".